New Blue captain Johnson Chu could barely put his happiness into words, so he did what felt right: making snow angels on the Quinnipiac Intramural Field. “It feels like Cloud Nine,” Chu said. Teammate Nick Buondonno joined him. Four years ago, merely stepping on that field was a dream. Even though they realized their dream last week, nothing could compare to the team’s new accomplishment. 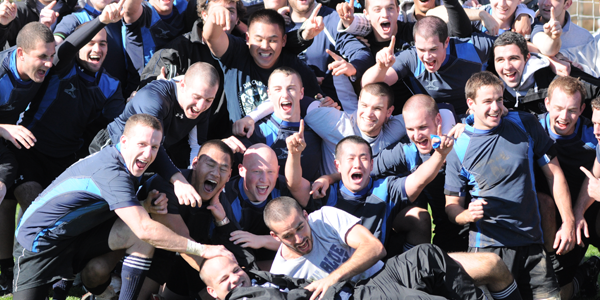 With no coach, no funding and no definitive home at the beginning of the year, New Blue won the New England Wide Collegiate Rugby Conference Championship Saturday, beating Central Connecticut State, 43-19, en route to a perfect 8-0 record. Comprised of all Quinnipiac students, New Blue is unaffiliated with the university, but after working with administration and athletics, the team was able to host a game at Quinnipiac last Saturday. After beating Western Connecticut State University last weekend, New Blue tried to host the championship game at Quinnipiac and got what it wanted. New Blue has been fighting to become a club sport at Quinnipiac for years after it had become unaffiliated from the school. During the game, the referee even called New Blue “Quinnipiac.” The players and Medina took notice. Four years ago, there were only four players on New Blue who were in the class of 2013. This year, 20 seniors lead the team not only to an undefeated season, but to Bristol, R.I., where the team will play the Colonial League champions and if they win two games there, they will head to Colorado for the national tournament. “We showed we could compete with the best,” MacLellan said. Few thought New Blue would make it to this point. After all, the team had missed the playoffs for three straight seasons. But after the team beat Hartford, 8-5, in its season-opener, there was something different about this team. “After the first game, the fight, you could tell that this was a special team,” said Jimmy Whelan, last year’s captain who has acted as the team’s coach this season. New Blue turned a 10-point deficit with less than 10 minutes to go into a 17-13 win vs. Babson in the third game of the year, and nothing would stop the team. “After three years of the same thing, missing the playoffs, losing games against really good teams…” Buondonno said. “…We turned it around,” Chu said. Four different players scored for New Blue, including MacLellan. Villalongue scored two trys, converted one penalty kick and made five extra points in the windy conditions. Christian Plunkett and Joe D’Apice also scored. “We all pulled in to get the win,” Villalongue said. Villalongue came through early, kicking a penalty kick in the third minute. Five minutes later, he set up D’Apice’s try by punting the ball from 20 yards out. The ball took an odd bounce on the pitch and went right to D’Apice, who ran it in untouched from five yards out. In the 52nd minute, Villalongue broke two tackles down the middle of the field and dove into the try zone to make it 29-7. Fourteen minutes later, Villalongue took the ball from the right side, stiff-armed a defender by midfield and then juked a defender to run 50 more yards untouched to give New Blue a 36-7 lead. MacLellan scored twice, the first to give New Blue a 22-0 lead that it would take into halftime. He clinched the game with a try in the final minute, as the players stormed the field shortly after.